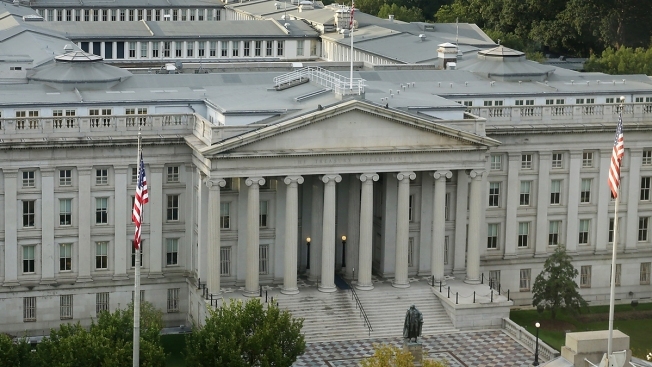 This Sept. 29, 2014, file photo shows the U.S. Treasury Building as seen from the Bank of America offices in Washington, D.C.
A U.S. Treasury employee has been arrested on charges that she leaked to BuzzFeed News multiple reports about suspicious financial transactions involving ex-Trump campaign chief Paul Manafort, law-enforcement officials said. The highly confidential documents allegedly leaked by the employee also were related to former Trump campaign official Richard Gates, accused Russian agent Maria Butina, a suspected Russian money launderering entity and the Russian Embassy in Washington, according to a criminal complaint. Natalie Mayflower Sours Edwards, a 40-year-old senior advisor in Treasury's financial crimes enforcement network who was arrested Tuesday, will face federal criminal charges in New York, officials said. She is charged with unlawfully disclosing so-called suspicious activity reports, or SARS, and conspiracy to do the same. Both felony counts carry a maxmium potential sentence of five years in prison. A Quinton, Virginia, resident, Edwards was released on a $100,000 personal recognizance bond after her presentment Wednesday afternoon in U.S. District Court for the Eastern District of Virginia. Under the conditions of her release, Edwards is barred from contacting reporters or handling documents belonging to her Treasury division without approval. A lawyer for Edwards did not immediately respond to a request for comment. SARS are used to alert Treasury officials and other authorities about financial transactions that may be related to criminal conduct, such as money laundering. Treasury's FinCEN division, for which Edwards works, manages the collection of SARS. It is illegal for a government employee to disclose a SAR or its contents outside of the scope of their work. The complaint against Edwards says that she started leaking "numerous SARS in October 2017" to an unidentified reporter, and continued doing so until this month. She had "hundreds of electronic communications" with the reporter, "many via an encrypted application," the complaint said. After Edwards began leaking SARS, the journalist wrote about a dozen articles which mentioned the details of those reports, according to the complaint. Articles cited in the complaint carry the bylines of Jason Leopold and Anthony Cormier, two BuzzFeed reporters, as well as other journalists at that media outlet. The articles cited documents transactions pertaining to Manafort and Gates, both of whom have since pleaded guilty to financial crimes related to their consulting work for a pro-Russia political party in Ukraine. They also related to Butina, who is currently being held without bond on charges of being a Russian agent, the accused money launderering real-estate entity Prevezon Alexander, and the Russian Embassy in Washington. At the time of Edwards' arrest, according to federal prosecutors in Manhattan, she "was in possession of a flash drive" that appeared to be the same device "on which she saved the unlawfully disclosed" SARS. Also in her possession was "a cellphone containing numerous communications over an encrypted application in which she transmitted [SARS] and other sensitive government information" illegally, prosecutors said. "When questioned by law enforcement officials [Tuesday], Edwards confessed she has provided [SARS] to [the reporter] via an encrypted application, through falsely denied knowing that [the reporter] intended to or did publish that information" through a news organization, the complaint said. BuzzFeed News declined to comment. Leopold and Cormier did not immediately return requests for comment.